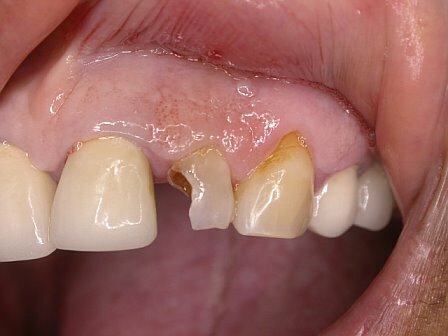 CEREC, one-visit dentistry — This 55-year-old woman came in with a broken upper left lateral incisor. Observe how broken down the tooth is. After the tooth was re-shaped, an optical 3D “impression” was taken with a small infra-red camera. Using the image data, the restoration was then designed and milled. 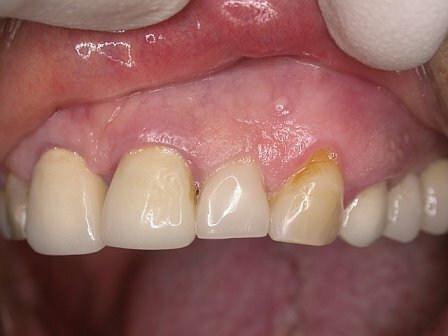 A TriLuxe block of ceramic (1M2) was used to enhance the translucency at the incisal edge. Post-op photo: An esthetically pleasing, all-ceramic crown was cemented onto the tooth 1.5 hour later. Since the crown is completed in a single appointment, there is no need for temporary crowns or second anesthetic injection.